I'll return to this microphone, if I may, okay? Now let me try to get my point across on this because this is crucial. And we both agree that Dr. Craig's strategy has been to try to prove that propositions (1) and (2) are compatible on the grounds that there is a third proposition which is consistent with (1) and with together with (1) implies (3). I've said that (3) . . . Entails (2). Sorry! I've said that his (3) is all by itself inconsistent with (1). Let's look at it like this [draws circle on the overhead]. 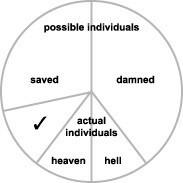 Let that circle represent the set of all possible persons that God could have created with free will and of whom He knows in advance from the very beginning, in the words of the Bible, what the outcome of their choices would be. Okay? 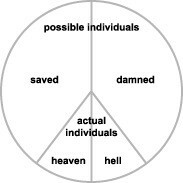 Now that set of possible persons, possibilia as you call them in one of your works, can be subdivided more or less arbitrarily, we'll say, into those who would be saved if He were to create them and those who would be damned as a consequence of their free choices [divides the circle into two halves labeled "sacred" and "damned" respectively]. All right? I don't want to be difficult, but I think that's too simplistic because some people might be damned if created in some circumstances but saved if they were created in other circumstances. So you can't just divide the line down the middle and put people on either half. It depends on what world these possible persons are put into. So we can shift the line wherever you wish according to which actual world God chooses to create. All right? Now He creates an actual world [designates a segment of the circle overlapping both halves]. These are just possible individuals up here, the whole domain of possible individuals with free will [designates individuals outside the segment]. Here we've got the actual ones [designates individuals in the segment]. And, as you can see, some of them on this have been assigned to heaven because God knew in advance that if He were to create them in these circumstances, they would be saved. And, here we have those He's consigned to hell. In fact, I've been generous to God and you here because I've created equal parts. And, of course, Jesus says it's going to be pretty rough on most of them. Now the point is this. Why did God have to create just this subset of possible individuals with free will? [designates segment of actual individuals] He could have sliced the pie a very different way. He could have sliced the pie so that there weren't any in this segment at all, the segment of hell [shades sub-segment of actual, damned individuals]. He could have chosen to create a world in which no actual individuals like you or me were existent [draws another segment outside the segment of actual individuals]. After all, there's nothing all that great about us, is there? And my point is He wouldn't be able to guarantee--so long as those people have free will--that they would FREELY RESPOND TO HIS OFFER OF SALVATION AND BE SAVED. But if He knows in advance that these will in those circumstances be saved by virtue of freely accepting God's offer of salvation through the blood of Jesus, then why not? I understand quite well about them having to be compossible. And, let's just say that out of the set of all possible inhabitants of this world that God is going to choose to create, only some are compossible. So let's make it a subset. We now have a subset of compossible individuals all of whom would be saved. But, see, my point is that you don't know that such a set is not the empty set. It could be the empty set. Well, look, you play with possibilities. You talk about it's possible that this, it's possible that that. . . I'm asking you to confront some actual examples of possibilities. Heaven is allegedly a state of affairs in which God exists and the only other persons to exist are people who either have been saved because they believed in Jesus' name or would have believed in Jesus' name and have been saved or you could throw in a few of those who get there by general revelation. You've still got three minutes. There's a lot of evasion from Craig in this sequence, and many appeals to ignorance. The debate has been discussed previously by others such as Jonathan Pearce (who argues that WLC's argument violates the ontological argument, because we can conceive of a better god than WLC's god, one that is not obliged to create a world in which a significant proportion of the inhabitants would be consigned to hell) and Luke Muehlhauser (who applauds Bradley for being prepared for the debate, unlike many other atheists who meet WLC on the debating podium), but I want to take a slightly different tack. Now, note that WLC is not arguing for divine ignorance, by which I mean the idea that free will might preclude a god from knowing whether a given person will be saved or not. Bradley gave him the opportunity (a few times) to make such an argument and instead of doing so, WLC gave a "compossibility" argument. I'm willing to accept that WLC misspoke and that he was not suggesting that his god could find certain acts impossible (as opposed to infeasible) and instead I'll focus on what he is saying about the possible lack of compossible sets. What is being suggested here, by WLC himself, is that there is a possible world in which S-prime is freely saved although in that world, S would be lost, as well as a possible world in which S is freely saved while S-prime is lost. Conceivably there would be another world in which both would be lost. Think about that for a moment. No matter how you want to paint it or buff it, this is predestination. The claim entails a situation in which a god chooses which world to implement, notionally allowing either S or S-prime to freely choose to satisfy the requirements for salvation (although another optimum solution could have both S and S-prime being lost so that T, U and V together with their primes might be saved). And this is despite there being possible worlds in which one or another of S and S-prime might be saved. Therefore, the salvation of S and damnation of S-prime is purely the result of god's decision. From the very moment of creation, S-prime is excluded, despite being able to act freely. And therefore, god consciously places S-prime into the (future) eternal flames of hell. Bradley's argument, which I agree with completely, is that an omnibeneficient god would not and could not consciously choose to create an intelligent being knowing (via omniscience) that that being would be tormented forever. WLC also agrees (at least where bunnies are concerned). Remember that we are talking about a maximally excellent being (MEB) here, which incorporates omnipotence - unlimited in power, unlimited by time, unlimited by space, although apparently limited by logic (the logically impossible is not required of an omnipotent god, according to WLC and his ilk, which is strange, since they could bypass such objections as the problem of evil in one fell swoop if they only allowed their god to be immune to logic). An omnipotent MEB is not restricted to creating a single world in which all its playthings interact in such a way as to enable the salvation of one at the expense of another. Remember that this MEB knows the outcome of all your freely made decisions, and knew it before you were created. It already knew all your choices, all your interactions, all your innermost thoughts and the same applies to every being around you. So, as far as you are concerned, from the perspective of the MEB, it doesn’t matter whether you interact with actual free acting lesser beings or theological zombies (soulless automatons which merely act out the behaviour of those who would otherwise be damned). The priority of this MEB (according to WLC) is to ensure that the maximum number of humans come to freely choose to know and love it. It's not to minimise the number of worlds created, or to maximise the actual interaction between lesser beings, or to not create theological zombies. Therefore, an MEB of the sort that WLC believes in would choose to create a possible world in which S would be saved (largely inhabited by theological zombies, including a theological zombie playing the role of S-prime), a possible world in which S-prime would be saved (in which the damned S would be portrayed by a theological zombie) and so on such that each and every created soul would be saved. That's a rather terrifying idea. For each and every believer, there is a possibility that this universe is created just for them and people like them, because in any other configuration they would be damned. While it might be comforting to know that there might be a number of actual, predestined-to-be-saved people in amongst all the theological zombies - you could never know which is which. Your mother, zombie or real person? Your child, zombie or real person? Your partner, zombie or real person? But it gets worse. This world would be the one, presumably the best one in which these people would be saved. Everything that goes on around them would be contributing to that salvation and every bad thing that happens would (due to the thorough goodness of the MEB) be necessary. Therefore, for these people to be saved, it is necessary that three quarter million people die each year from dysentery. It was necessary for journalists to be beheaded in Syria. The tsunamis in Japan and Indonesia were necessary. Droughts and floods and fires and earthquakes and mudslides and mental illness and drug addiction, the election of Trump and all sorts of social chaos - all are necessary to save these people. These are not good people if they could not possibly have been saved in a better world. Apparently WLC is one of these people (although I freely admit that, within this premise, it's much more likely that he is a theological zombie). Finally, I would ask any theist who is accidentally convinced by my argument to treat any and all theological zombies with the utmost care and respect. It seems that we're here - dying and suffering, putting up with you, or at least simulating it - just to help you get into heaven because you failed to manage it in any better world. More zombies and the logic thereof.